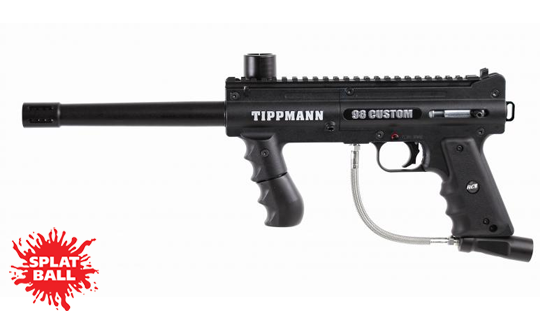 The Tippmann Paintball 98 Custom Platinum Series paintball gun is the workhorse of the Tippmann line of markers. It’s the marker we use as our rental gun at all of our Minnesota paintball fields. The durability of the 98 Custom is unbeatable. This is the perfect starter gun for players new to the sport of paintball. The 98 Custom will get you on the field with room to grow as your game does. You can customize the look and upgrade the performance when you’re ready to get more serious about your game. The 98 Custom Platinum Series also features an aluminum receiver. Key performance upgrades include the E-Trigger Kit, Response Trigger and Cyclone Feed System. The 98 Custom is compatible with many Tippmann and after marker accessories and comes with Tippmann’s World Class 2-year Warranty.